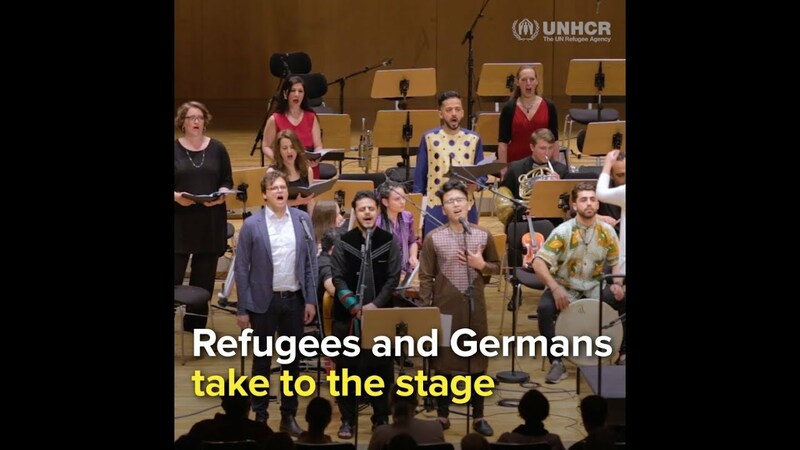 An orchestra in Frankfurt is bringing refugee musicians together with local and other international performers. Waseem Hariri from Syria rehearses with the Bridges orchestra. The song, Das Heimweh (homesickness) by Fanny Hensel, may be two centuries old, but Amir sings the words from his heart. He was just 16 when he fled persecution in his adopted home of Iran. “Music is a good way to integrate." In 2014, Amir joined his elder brother in Frankfurt, where he was granted asylum, re-started high school and began learning German. But something was still missing. That’s until Amir, who also plays the guitar and sang in a classical choir as a child, heard organizers of a new project were looking for musicians among Germany’s new arrivals. Early in 2016, he attended the first meeting of Bridges, which brings refugee musicians together with local and other international performers. “It was a very loose vision – the idea was that music connects, that we have that in common,” explains Bridges cultural manager Anke Karen Meyer. The aim was to use music to encourage an intercultural dialogue that would be mutually beneficial to newcomers and locals. Around half of Bridges’ 70 musicians recently arrived in Germany – some of them as refugees. They come from a wide range of musical backgrounds, from jazz and pop to classical, hip-hop, blues and world music. Now three years old, the orchestra recently performed their third concert. One Bridges composer is Abbass Anoor, a former refugee from the Darfur region in western Sudan and the project’s resident expert on African hip-hop. The rapper came to Germany in 2010 and has since been granted German citizenship. He says Bridges inspired him to adopt new sounds. “It’s this wonderful, bizarre mix,” agrees Rainer Michel, a German film composer who through Bridges collaborated with Abbass on another musical project. “I loved that straight away that we could try out things that didn’t necessarily fit together logically. Amir and other Bridges musicians fuse Arabic, African, Asian and European influences. He says the collaborations have opened his eyes musically, but the project has meant more than just the chance to invent new sounds. For other newcomers, the project has served as a social lifeline and catalyst for integration.